the sweetest thing...: FIVE Days Until the MFT March Release! 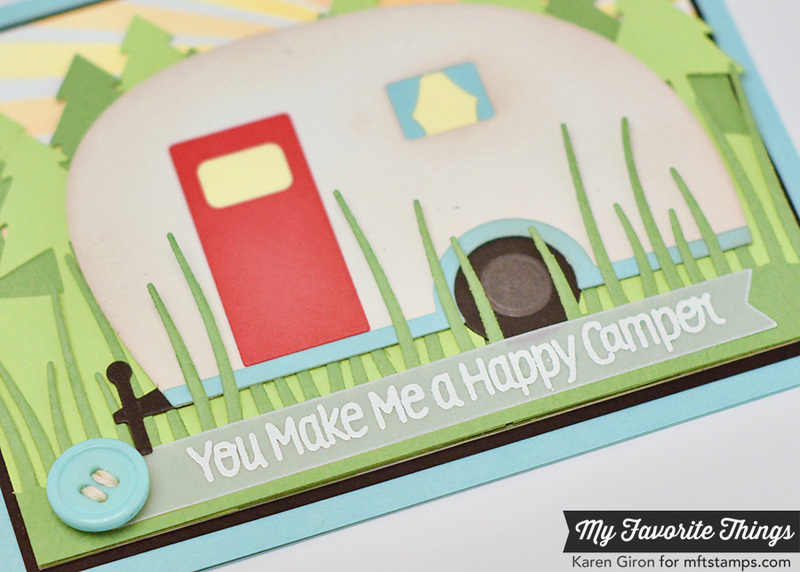 My card tonight is another scene building peek - take a look at the new Happy Camper Die-namics! It's time to book those summer camping trips! This card just makes me smile. I started off by cutting out the camper in Primitive White Card Stock and then sponged around the edges with Natural Ink. I cut out the window pieces in Banana Split and Berrylicious Card Stock and then wanted a bright Red Hot door. 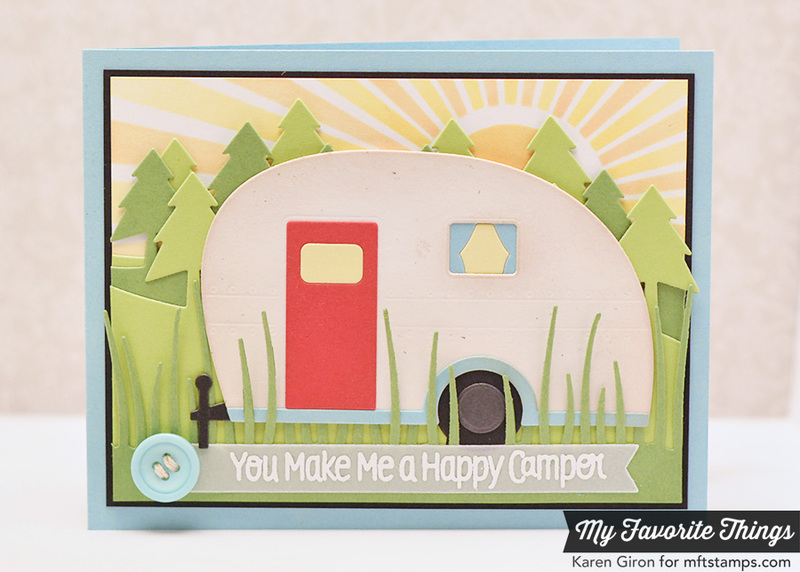 I used the Tall Grassy Edge Die-namics in Gumdrop Green Card Stock and then tucked the camper in it so that some of the grass was in front of the camper. The background is the new Campy Tree Lines Die-namics and then I used the Sun Ray Stencil to create the sun. I stamped the sentiment in Sweet Tooth Ink and then heat embossed it with white embossing powder. I'm on a vellum kick, what can I say? So darling. Love this little trailer. Wasn't sure about it at first but as usual you and the talented members of the design team have changed my mind. Again a very nice background. Lovely scenery! What a fantastic scene you've created!! This is fantastic!! The cards for this set just keep getting better and better, love this Karen! Love your camping card. That sun ray in the background is the perfect touch to this. Great job at layering the different elements. Kudos! The sentiment is so fun! Man oh Man! This is such a wonderful sunrise/sunset nature-y card. The grass gives it Umph! Sunrise and sunset are always more beautiful at camp and the beach! This card has it all: Beautiful color combo, great layout, details like the grass in front. Wonderful! Your card makes me smile too. It is adorable. So cute! I love the grass! What a fun masculine card!! Super cute! Love the sunshine! Wonderful! You have created a colorful and adorable scene. This card is so bright and fun, love it! So Cute! I want to go camping, now. LOL I love the rows of trees in the back too, with the sun peeking out.